It all began on Saturday morning at the Canadina Music press reception at Tonder Festival 1997. We sat there at a table with a few other guys, and it took quite a time until we realised that they were part of the band we were most curious to see: Barachois. It was a quite happy reception, as the Canadian ambassador had sponspered 600 cans of beer for maybe 30 musicians and press people... As we talked we became interested in the tradition of this special Franco-Canadian band. In Canada there are some European based musical traditions preserved that in the European mother country have long since died. When now a Canadian band comes to play its music in their original mother country, it might be exciting for the people to see their traditions that they do not know. When Barachois played in France in their ancestor's home region, they had good reactions to their music. Thinks Hélène, "they were very interested in the fact that we preserved the traditions whereas they lost them, and being such a minority, and being so far away from their mother country in another country, that the traditional music was there safe, they found it very interesting." A lot of people in France say that they have lost their traditional music, especially in the Maritime part where the Arcadians come from. In Brittany, in Normandy and in parts of Southern Franceand the Pyrenees there is still traditional music, traditional costumes and dances, but in the part of France where the Arcadians - and Barachois - have their origins, people say they have lost their traditional music. "So they do not recognize the songs that we do. Although - once we did a songs there, and afterwards a lady came to us and said she knew that song, she has heard that song before." It is not that music and songs are preserved in its original form; there were different influences when the Arcadians came to Canada - mostly fiddle music. "Where we live now, there are a lot of Scottish and Irish influences in the music. 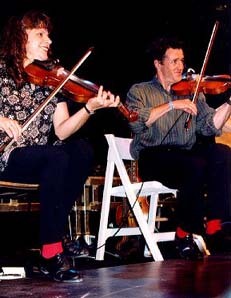 So there is a Scottish style in the fiddling; and when we mix that with the singing it sort of makes another style. Barachois as band have been together for two years. Their live performances are indeed special, they make with their high quality traditional music a real comedy show where no eye stays dry - without doubt one of the best live acts around. "We always played music because we grew up in musical families (except Chuck). Our fathers played the fiddle, and we heard the fiddle music all our lifes, and we all started dancing very young. ", recalls Hélène. The songs that they do are traditional; most of them come from France, they are very old songs. They have been passed down from generation to generation, mostly from mother to daughter, when the women were working, The generations worked together and used to sing while working to make the work all faster. "All the songs have been preserved, they've all been collected and preserved in a collection in archives in a university. So when we want to find material we go and look in that collection. There are tapes, not commercial tapes, they have been taped in peoples' houses; the older women who still know the songs have all been recorded. A lot of them have their feet like that (begins with sitting step), they sing and tap their feet." Barachois take the songs from these archives, and put then music to them and arrange them. And, as Albert says, most of the songs have never been recorded. While the songs were headed down by the women, the dancing came more from the men. Many men were dancers, step dancers. And a lot of men were fiddlers, and a lot of women played the pump organ. "But this is just in general, there were also men who played the pump organ, and women who played the fiddle." 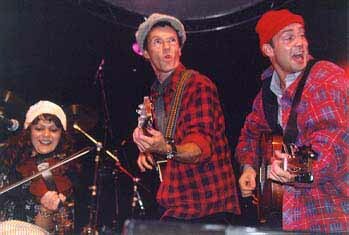 In Barachois, the men (Albert Arsenault & Chuck) do mainly the singing, and play guitars, brass instruments, percussion and diverse other strange (self built) instruments, while the women (Hélène Bergeron, Albert's sister and Louise Arsenault, no relation to Albert and Hélène) play keyboards and fiddle, and also sing. All do sometimes sitting step and normal step dancing. If you look at the Franco-Canadian scene in general, there are a lot of small French communities in Eastern Canada, some also with small pockets of French music. "In Québec, there is a big big French scene; it is very seperate from us though. It's a different style, and the language is - it's a different French too. They have trouble understanding our French, because our French is - you know the grammar is influenced by English. There is a very old dialect mixed in our French that is still used, and that a lot of people in Québec don't understand. So it's like a different culture really." One of the reasons is also that the Arcadians come from a different region of France than the people who settled in Québec. And there are different dialects in French - especially two hundred years ago, when they were even more different, because there was less contact. "And we have been seperated now for two hundred years so we developed different directions." Then in Canada, there is also the influences of different cultures around them. "So that all devolved into kind of our own accent and lanaguage - it's very seperate. It's typical for the small regions, too. Each little Arcadian region almost has its own dialect and its own expressions that is typical for that area." At the moment there is a big folk revival in Canada; everybody is at the moment recording and many of the younger generation are picking it up because it's very in, very cool now to play tradional music. "But it's something that has always been there, it's just being discovered now. ", reminds Hélène. "So because it's getting more attention, more people want to do it. It takes a momentum of its own, it kind of snow balls." The French Canadian and British Canadian scene is very much the same one in Canada; there are often shows with both French and Scottish Canadians, with the same reactions in the audience. "It seems that it's just the fact that it's traditional music that is important." And the Maritime provinces festivals like to get representatives of the different cultural groups like Québecan, Irish, Acadian and Scottish. And everybody seems to enjoy the differences. And that is good to hear. FolkWorld: Do you plan to come more often now to Europe? Helène: We'd love to; we just need to be invited! Albert: Yes, yes; next destination: Germany. Helène: We need you to invite us though! Albert: Yes, yes, we need you to have a lot of money. Albert: Yes, that's what we have been drinking all here. Helène: But yes, this festival might open some doors to us to other festivals here in Europe. And we would really like that!